The History of the of Conwy Castle dates back to 1283. The site of Conwy Castle was chosen not only for its natural features but also because of its symbolic importance (also see Caernarvon Castle Welsh Mythology). Conwy was equivalent to the capital of North Wales and was the burial place of Llywelyn ap Iorwerth also known as Llywelyn the Great (1143 - 1240) - a great Prince of Gwynedd. Llywelyn the Great was buried in the Cistercian monastery of Aberconwy (the Welsh equivalent of Westminster Abbey). A statue of Llywelyn the Great can now be found in the town square of Conwy. Conwy Castle was a massive stronghold - practically unassailable. It is believed to have been captured as the result of a trick in 1401. A carpenter gained access to Conwy Castle during the Easter celebration of Good Friday when the garrison troops were at church. The carpenter admitted a group of Welsh rebels who proclaimed their allegiance to Owain Glyndwr ( 1355 - 1415) a great Welsh revolutionary leader. In 1400 Owain Glyndwr declared himself Prince Of Wales and embarks on rebellion against the occupation of Wales by England. The revolution was successful and by 1403 the Welsh controlled most of Wales. King Henry IV of England crushes the Welsh army in a series of Battles during 1410. Conwy Castle was again in the hands of the English King. Conwy Castle was used by the Royalist during the English Civil War in 1642. In 1646 the castle was besieged by the Roundheads, the Parliamentary forces for three months. After the restoration of the English monarchy the castle was purchased for £100 by Viscount Conwy in 1628. Conwy Castle is one of the most magnificent castles in North Wales. Who had Conwy Castle built? Most of the Welsh Castles built by Edward I and Master James of St George, were built as as Concentric Castles. The Concentric Castle design featured at least one lower, outer wall surrounded the Inner High Wall with several outer walls. Outer baileys and moats were often added. The Inner Walls were higher than Outer walls. The location of Conwy Castle was chosen as a natural castle site situated on a huge jutting rock, facing the harbour. There was no room to build the series of defensive walls which were a defensive feature of the great concentric castles. Other defensive mechanisms were put into place! 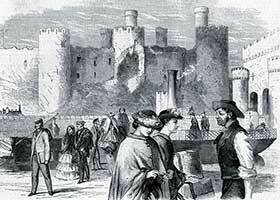 The history of the building of Conwy Castle is fascinating. In just a relatively short period of time a significant number of new Welsh Medieval Castles were built or modernised under the instructions of King Edward I (1272-1307) including Conwy Castle. King Edward employed the services of an architect and master builder called Master James of St George to carry out many of these ambitious plans for a chain of Medieval castles to be built in Wales. Conwy Castle was built in North Wales on the estuary of the River Gyffin. An important feature of Conwy Castle is its access to the sea. During the construction of Conwy Castle men, equipment and building materials were easily transported by boats to the site of the castle. Once Conwy Castle was built fresh supplies, provisions and reinforcements prevented the castle occupants from being starved into submission during siege warfare. The advantages of swift and easy accessibility via the sea ensured that the new fortified town, which was built at the same time as the castle, became a successful and prosperous stronghold for its English inhabitants. Conwy Castle was constructed in conjunction with a new, fortified town. The idea of building fortified, purpose-built townships were based on a combination of the Bastides of Gascony and the Burghs, or Burhs, built by King Alfred the Great of England. Welsh Medieval Fortified Townships. The 'Bastide' at Conwy was a strongly defended town, the construction of which, had been subject to proper planning and architectural design. Conwy Castle was one of the ten key Welsh Medieval Castles which were commissioned by King Edward I. The Welsh Medieval Castles built by the English under the direction of King Edward I provided a power base for the Medieval Plantagenet King and ensured that the Welsh were subservient to the new English rule. Edward crushed the Welsh rebellion under Llewellyn ap Gruffudd and conquered his kingdom of Gwynedd in Northern Wales. Wales was conquered by Edward I and became incorporated into England under the Statute of Rhuddlan ( also called the Statute of Wales ) in 1284 - the building of Conwy Castle helped King Edward I to achieve his ambitions.